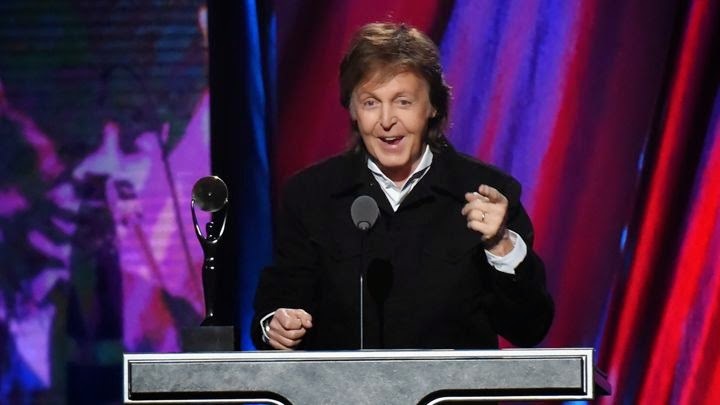 Here's Paul McCartney's speech to Ringo when the drummer was inducted into the Rock and Roll Hall of Fame in Cleveland, Saturday. Later on he joined a group called Rory Storm and the Hurricanes. And we saw these guys when we were out in Hamburg, we were playing out there. And Ringo was like a professional musician. We were just like, slumming around and doing stuff, but he had a beard — that's professional. He had the suit. Very professional. And he would sit at the bar drinking bourbon and seven. We'd never seen anyone like this. This was like, a grown-up musician. Ringo's thank you speech, amateur footage. Thank you. I want to thank Paul for all the great things you told us…some of them are true. You know, it's a great honor to be inducted into the Rock and Roll Hall of Fame. I was doing the press and they're all saying, "Well, why did you wait so long?" It has nothing to do with me. You have to be invited. But anyway, apparently I'm invited and I love it. I also love that I got lucky that it's happening in Cleveland, and I'll tell you why. When I started playing, I was playing in skiffle bands, sort of house party bands…and you know we had a guitarist, the first band I was in was really great…I had a snare drum and Roy, the bass player had a T-chest bass with a hole in it and strings. And so we're playing this skiffle music, playing anywhere we could. And then I joined a couple of other bands and I always wanted to play with great players and I kept moving up a little; up to the next band. Of course, I did end up with Rory Storm and the Hurricanes, and when I joined them, we were still a bit of a country folk band, and the guitarists in those days — this is a nice one for all you big guitarists with the big amps — we played the Cavern Club, which was a jazz club in Liverpool. And he brought a radio to plug into so we'd be electric. And we got thrown off. "Get out of here! That's not quite jazz." Anyway, we started off with a radio, the first amp we had. Things got going a lot better and we ended up playing a lot in Liverpool and around Liverpool. We never made it anywhere else, but while that was going on, I was working in a factory. After the things I've sat through tonight. Blah blah blah. I got some stories. I was working in the factory and playing at night and every Sunday, you know we lived in England, we only had the BBC. And to madness, there was a small country in Europe called Luxembourg, very small, population of about 6…and for some reason, they had the biggest radio master. And they bought the Alan Freed Rock & Roll show. And for the first time I heard…well I have to backtrack now, wait a minute to '55…Bill Haley was my hero…he was like the first one. Elvis came in. But anyway, I'm listening to this guy on a Sunday at 4 o'clock in the afternoon, and I hear Little Richard, first time ever. I hear Jerry Lee Lewis. And heard rock and roll music, because we weren't getting a lot of that stuff in England, and it came from this very small country. So 4 o'clock every Sunday, Rory and I would go to his house and turn on the radio and Alan Freed would introduce us to so many great rockers. And when I was a teenager, once…we played Little Richard, "Shag on Down to the Union Hall," it wasn't insulting to us, it's very meaningful. We couldn't believe we could hear this guy on the radio! Shag on down to the Union Hall! That seems a good place to go! Also, I came from a port. A lot of sailors came to and from Liverpool, would bring music from New York and all over America. They'd drink all the money; they'd sell all records. Anyway, I started collecting a lot of records, listening to music, and ended up in this rock and roll band. With Rory Storm and the Hurricanes, we go to Germany, and that's where I met, you know, the Beatles. I met Paul, John (God Bless You), George (God Bless You). We came back to Liverpool, and there was a knock on my door. The drummer wasn't well and would I sit in? Sure. Anyway, I was living that life then, I was out of the band, and I didn't have to get up till noon. So, that was good. So I went and played a lunchtime session with George, John and Paul, and we had a great time. And then I went and showed in some clubs in Liverpool. They're not around now. I'm sort of part of their downfall. And we became friends, we hung out, and then I would go back and play with the Beatles because the other drummer couldn't make it. Then, I got a call. We were playing a holiday camp in England, three-month gig, couldn't believe how great that was. Like $24 a week. And I got a call from Brian Epstein ... I got a call to say, this was Wednesday, would I join the Beatles. And I said, "Well, when do you want me to join?" And he said, "Tonight!" And I said, "No, I can't do that. I've got a band here. We've got a job. I'll come Saturday." Because everybody in Liverpool, we were playing the same songs so, they picked the drums and he could play. That's when this journey started. It's been an incredible journey for me with these three guys, who wrote these songs. I was talking just the other night. Paul had come in, strum some song to us, and we played it! We didn't spend a lot of time. There was a lot of joining… The Beatles, you know, they were so big and so famous, but they shared rooms, you know…every hotel, when we'd gotten one, or guest houses. But when we'd go to hotels, we always had two rooms. And it didn't matter who was with who, what would happen is we hung out. But until any band is in the room, you really get to know your other players. And another tip I brought for all bands who are starting out…when you're in the band, here's another tip, if you fart, hold your nose. Everyone's blaming everyone else…we made a pact in the van, okay. That's how we get on so well. I wanna tell ya, it's been a beautiful night, hanging out…we're gonna do a few numbers for you next. We gotta follow John Legend and Stevie Wonder for god's sake. Anyway we're gonna start with a number of…1960 I did this number. It was a woman that sung by the Shirelles and it just took my fancy — and it's called "Boys." Ringo was backed by Green Day for "Boys". Amateur footage. Some rigging of the stage then followed, with Ringo grabbing the microphone, entertaining the crowd. 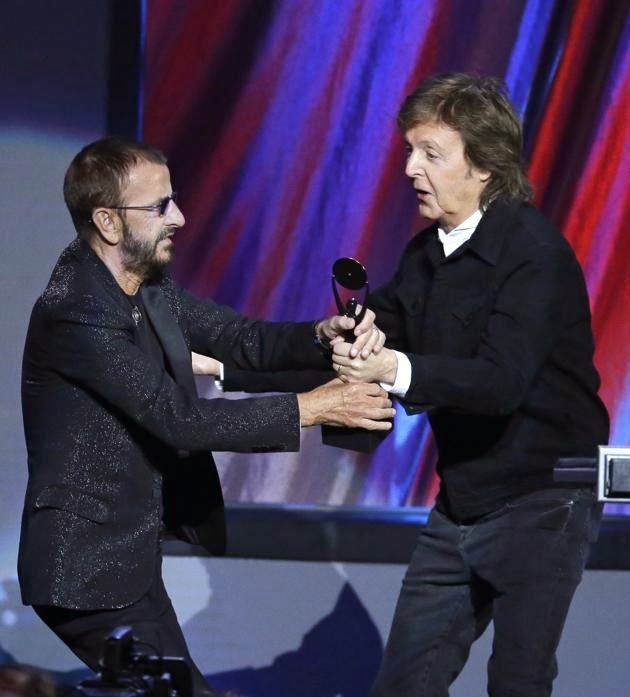 This went on for an uncomfortably long time, and Ringo ran out of material. So he put down the microphone and left the stage. After several minutes, he came back with Joe Walsh on guitar, and performed "It Don't Come Easy." Joe Walsh joined Ringo for "It Don't Come Easy". Amateur footage. 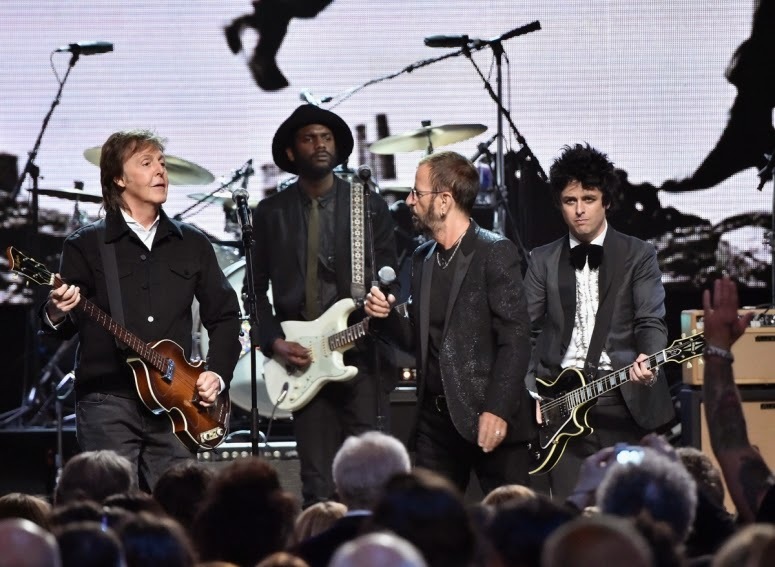 Paul McCartney came back on stage to join in on "With a Little Help From My Friends" on bass guitar only. Other artists also came on stage for the finishing jam, "I Wanna Be Your Man". Paul sang the final verse, and the artists all left the stage. 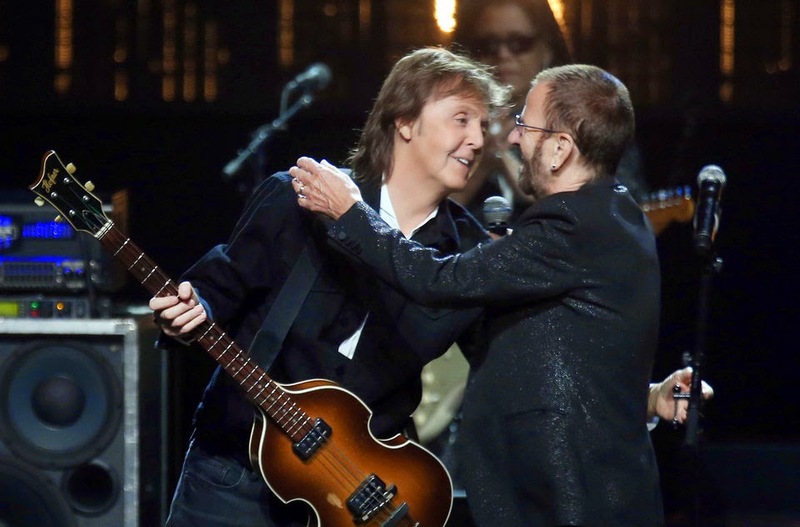 Paul and Ringo hesitated for a few seconds, grabbed each others hands and gave the audience a deep Beatles bow before it was over. 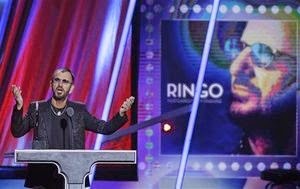 Ringo answers inaudible questions from the press. Paul and Ringo are about 2 minutes into this clip from HBO. Amateur footage of "With A Little Help From My Friends" and "I Wanna Be Your Man". Lost count now of how many shows and stages I've seen Paul and Gary Clark Jr share in the past few years. They still seem like they need to get introduced though! Did Paul write the labels? The Beatles on Ready Steady Go!